Coach Eddie Jones says England will face the "greatest Wales side ever" in a potential Six Nations title decider in Cardiff on 23 February. 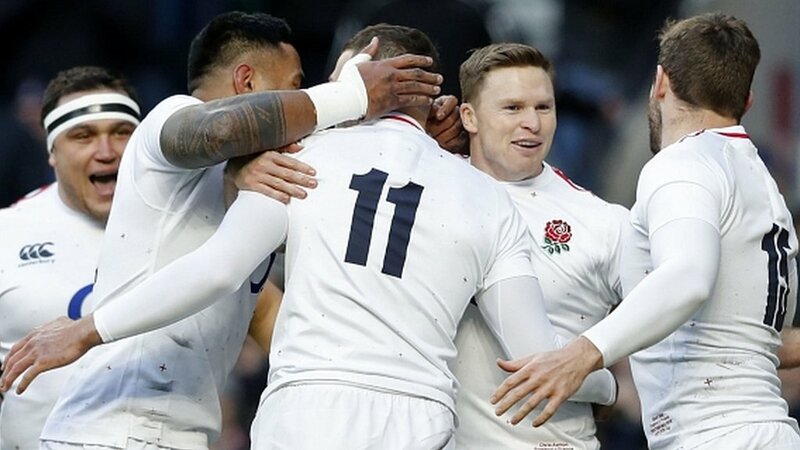 England overwhelmed France 44-8 on Sunday to follow up their win over Grand Slam winners Ireland last week. Wales recovered from 16-0 down to beat France in their opening match and overcame Italy 26-15 on Saturday. Warren Gatland, who will stand down as Wales coach after this year's World Cup in Japan, made 10 changes for the match against Italy and promised his team would be "a lot better" against England. "You're playing against a tough, physical team," added Jones. "They contest hard at the breakdown. You've got to earn every point against them. With a rest weekend meaning there is a fortnight's wait until the match, England scrum-half Ben Youngs said he would revel in the pre-match build-up. "It's going to be great. Whenever England and Wales meet each other, it is fantastic and now it has a bit added to it," said the Leicester scrum-half. "I'll embrace a bit of the hype and ignore a little bit depending on whether it's good or bad." Jones reserved particular praise for wing Jonny May, who scored a first-half hat-trick of tries to move to seventh on England's all-time try-scorer list with 22 from 42 Tests. "Jonny May's like when you go to the park and you see someone with a tennis ball and they throw it, the dog runs 100mph and chases it and brings it back. He does that pretty well," said Jones. May, 28, played down his man-of-the-match performance, saying: "I am just doing my job. "I know that is scoring tries but equally important is everyone else's roles. Everyone is working hard and putting performances together. "I think one day I will reflect and enjoy these things but I won't get ahead of myself. "Anybody who plays for England is lucky enough to be born with some kind of talent but it's about hard work too." "When I'm asked who the world-class England players are, I always say that Jonny May is one," said former England scrum-half and Radio 5 live expert Matt Dawson. "There are few in the world who could do what he did for the second try. He made mincemeat of Damian Penaud - someone who is super quick and elusive himself - in two yards. "He reminds me a bit of New Zealand's Israel Dagg, the type of player that can step around you but reads the game really well, finds himself in killer try-scoring positions. "It also helps that the rest of the team now understands where Jonny's strengths are, that he loves staying on his outside wing, that he looks for those little grubbers through. "Let's not forget he is blisteringly quick. He might be the quickest player on both sides, so why not exploit that and use it?" France head coach Jacques Brunel said: "Obviously I'm very, very disappointed. I'm most of all disappointed with what happened in the first half. "We were really under pressure from the English side, especially from their kicking game and we were not able to overcome that." France captain Guilhem Guirado added: "It's very painful when they score try after try. The pressure was constant and we never managed to get out of that."